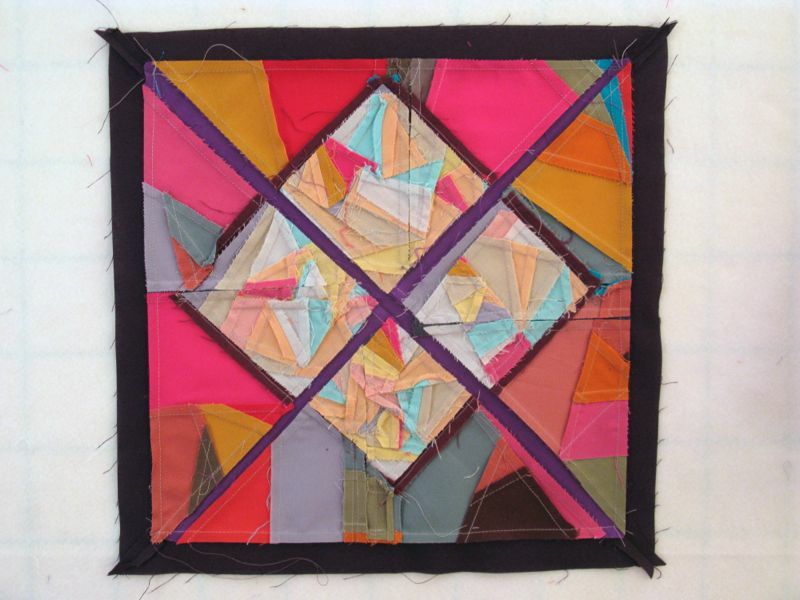 Structure: Four-in-Art Art Quilt, February 2014 | OccasionalPiece--Quilt! 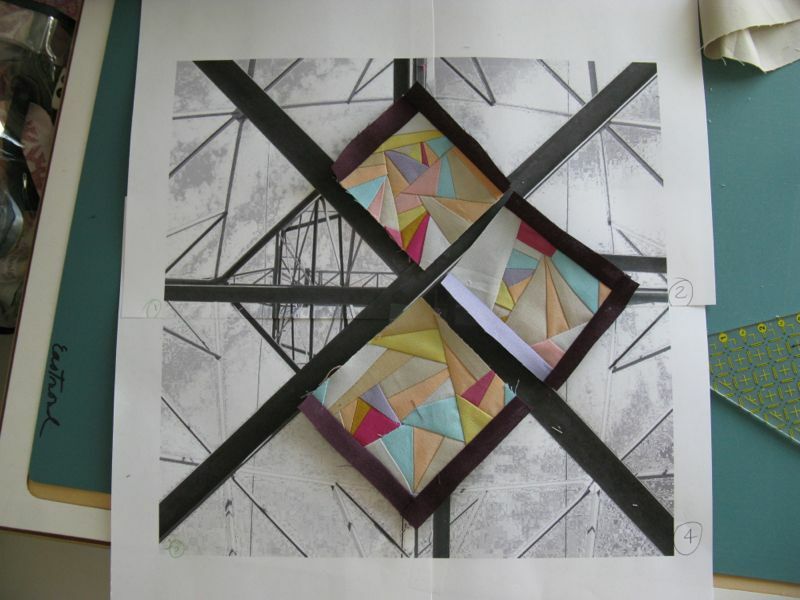 Posted on February 1, 2014 by Elizabeth E.
Leanne asked us to consider the theme of Structure for this challenge. While other ideas teased, the vision of these immense structures of steel and wire kept haunting me. My husband and I got off the freeway to follow a few, photographing their massive, yet airy, construction reaching high into the sky, grabbing a line and passing it to their fellow tower. 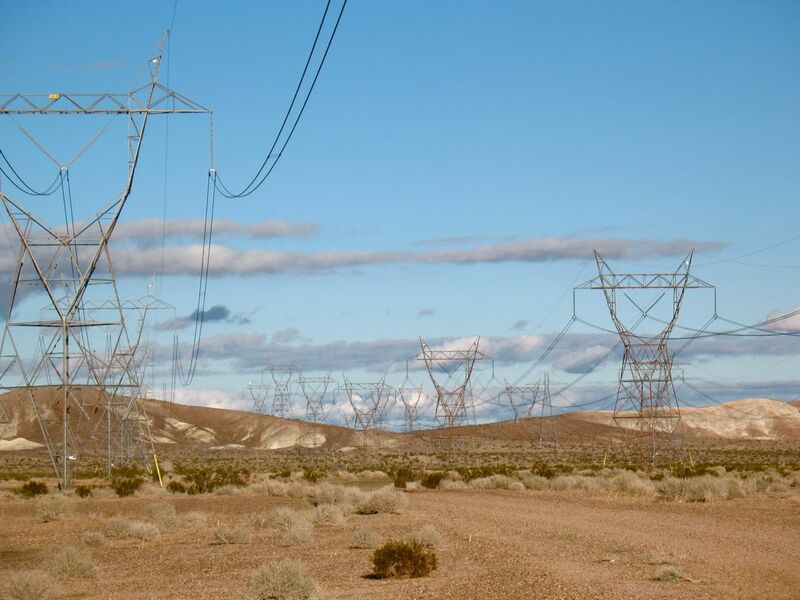 It made me think about structure in terms of how electricity — and their cousin, the telephone line — have created their own structure in our lives. We used to depend on mail, human contact, driving somewhere, but now we email, Instagram, Facebook, Skype, and need scads and scads of voltage to do it all. The structure of our lives has changed. I had hoped to make a quilt of tiny envelopes, distress them somehow, then superimpose the grand power scaffolding on top of that, representing the change in communication. It was not meant to be. 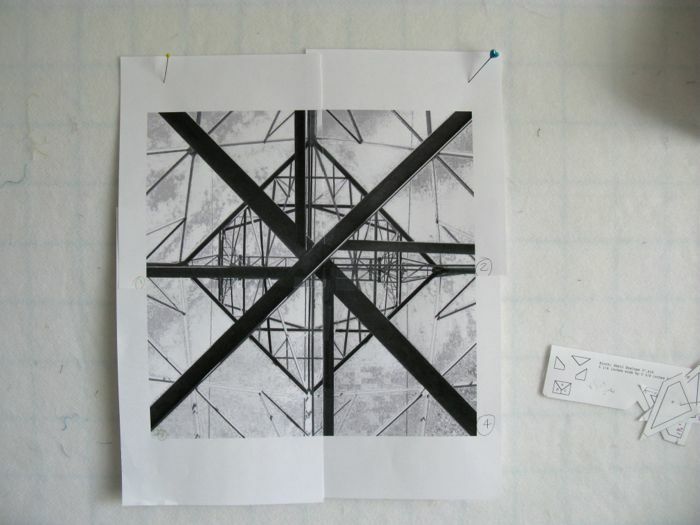 I printed out the upwards view of the tower, intrigued by its criss-crossing lines, then proceeded to sew together a billion little angular pieces. I kept thinking how proud of me Leanne would be, as she is the queen of improv quilting. As I completed a section, I’d lay it out. Done, but it was a bit small, so I added a border. I’m showing it from the back, as I’m mighty proud of those billions of seams. 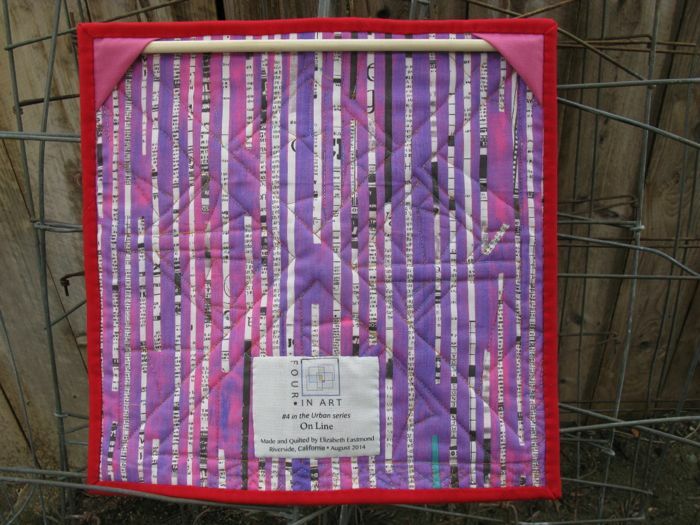 I chose a variegated thread and quilted where I wanted to. Maybe those scribbled lines in the border are conversations? Or interrupted code from a blog post? Or the news from a family member, broken into bits and pieces as it is transmitted? The fabric is scraps from my most recent quilt, Amish With a Twist Two, perhaps because I wanted to work with line and not pattern (and certainly with all the weeny subdivisions, there is plenty of pattern) but also because the sack of scraps had not been put away yet. I like this photo because the leaves and berries of the bush behind this tree call out the color in the quilt. Posing with its soul mates: the telephone box and the power meter. 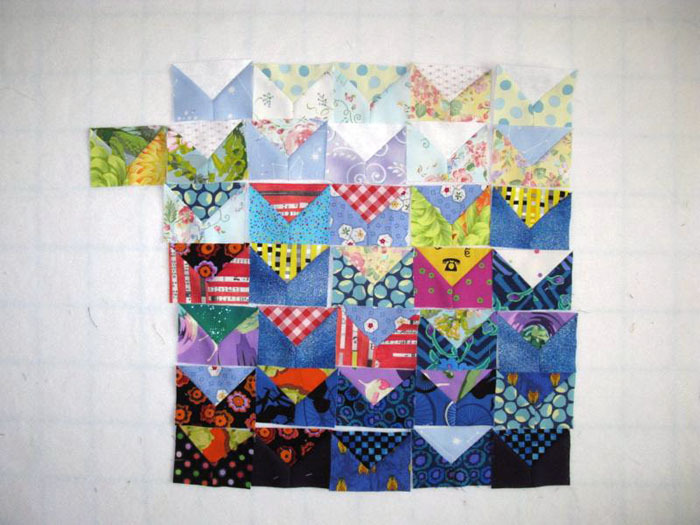 I had planned to piece all the little envelopes together and put them on the back, but I decided that with all the seaming, the quilt would be one gigantic lumpy square. Plain backing then, from the Collage line of fabric, and then added the label. That morning nothing would go right, so it’s on and done; not perfect, but sometimes that’s just how it has to be. 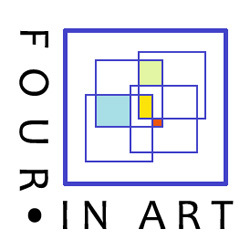 I owe my associations in this Four-in-Art group to these very structures, long looping lines bringing me quilting and friendship. 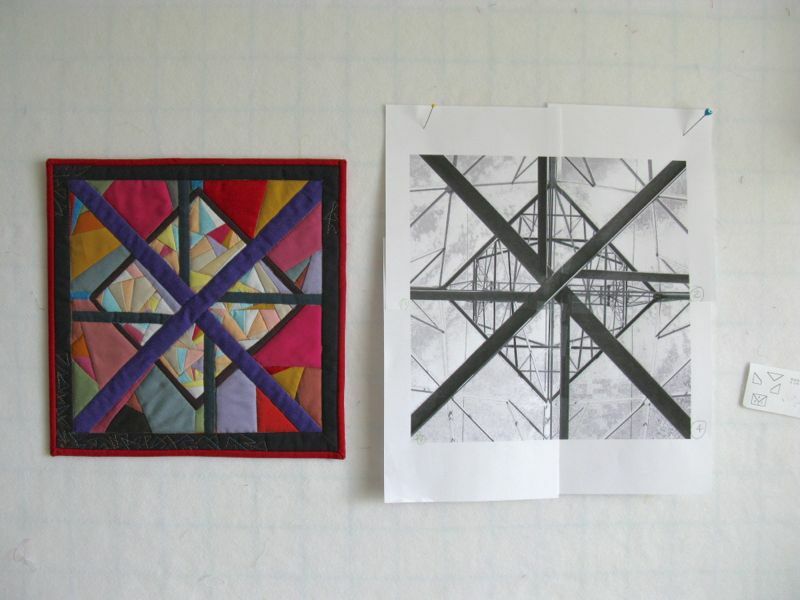 Since I wrote about how I made it, I won’t be doing a “deconstructed” post for this quilt. And when I hear what the new theme is for May, I’ll let you know. As usual, there was some amount of frustration over this quilt–deadline crept up on me, a “why am I doing this to myself?” moan (or two), and then the getting down to it. Teresa Amabile said “Creativity depends on a number of things: experience, including knowledge and technical skills; talent; an ability to think in new ways; and the capacity to push through uncreative dry spells.” At the end, I’m always glad I pushed through any dry spell to arrive at the finished Four-in-Art art quilt. Good for you for pushing yourself. We usually work best under pressure. I’m not sure why….. I love the way you have taken a graphic photo and turned it into a work of art. More amazing is those tiny pieces !!! Your work is amazing!! Elizabeth, this is a wonderful interpretation and what I hoped to find/see myself (but did not – was very literal this time)! Towers like this fascinate me and I’m so glad you viewed it – and interpreted – from the inside. Love everything about your little quilt – it’s perfect! Elizabeth! This is remarkable! The structure of our lives has changed and your interpretation of this change is right on! I love your interpretation and how you incorporated so much symbolism into your design. Really, really amazing! I am so proud of you and your improv. I think this is my favourite of your quilts for this group so far. 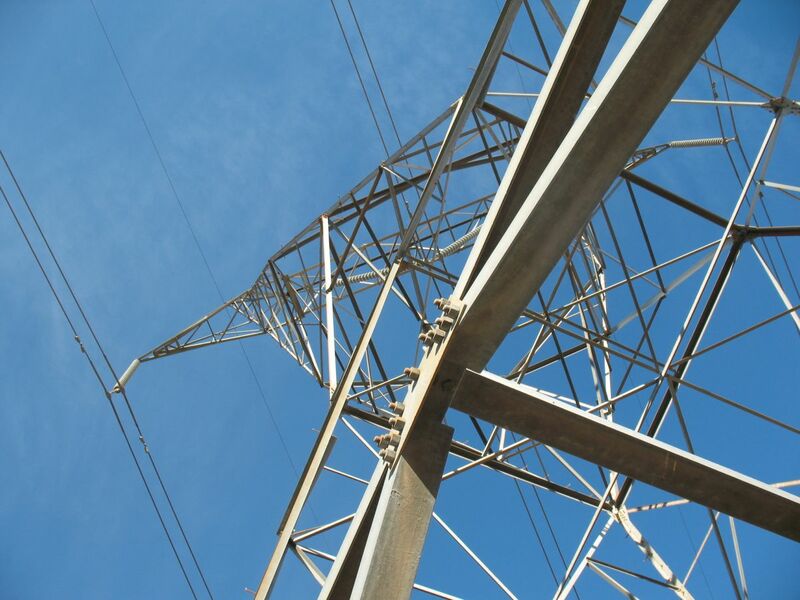 I love the billions of little pieces and the solids and the way it is full of energy and electricity. You have done such a brilliant job of interpreting the theme and also your photos. 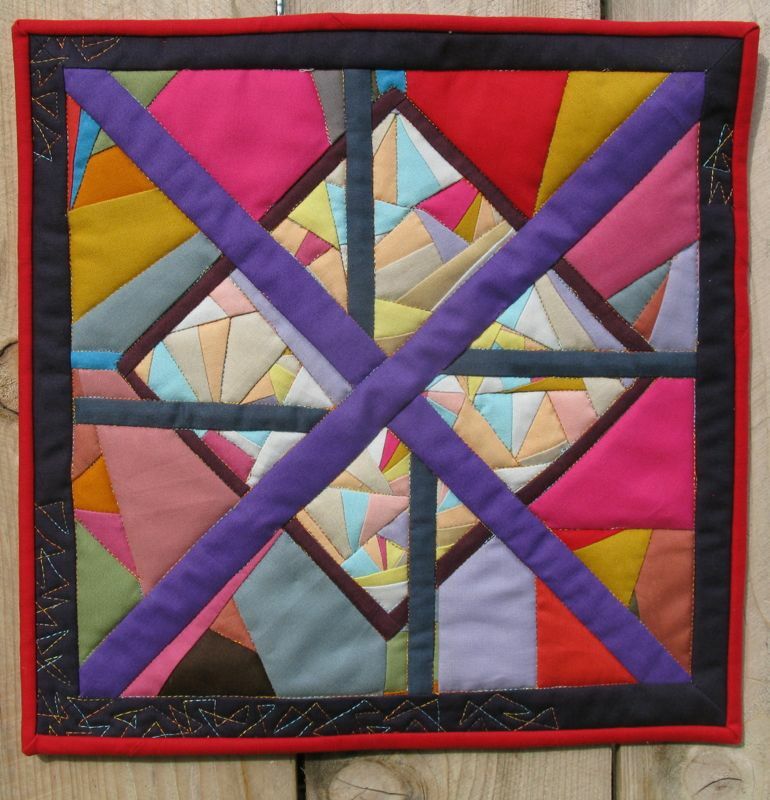 That bit of quilting in the border is just the right ending touch. I always love how you interpret things Elizabeth. The structure of our lives certainly has changed in ways we could never have imagined. 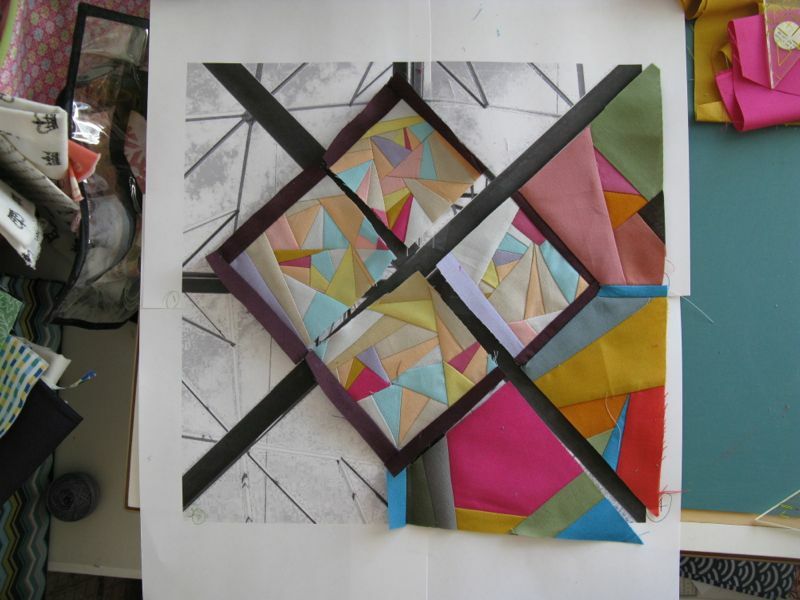 Your art quilt and post sums it up so well. I can’t imagine how tiny some of those little pieces must be. And yet our lives are made up of tiny bits and pieces that come together to make us who we are. The photos next to the quilt are fun to see too. 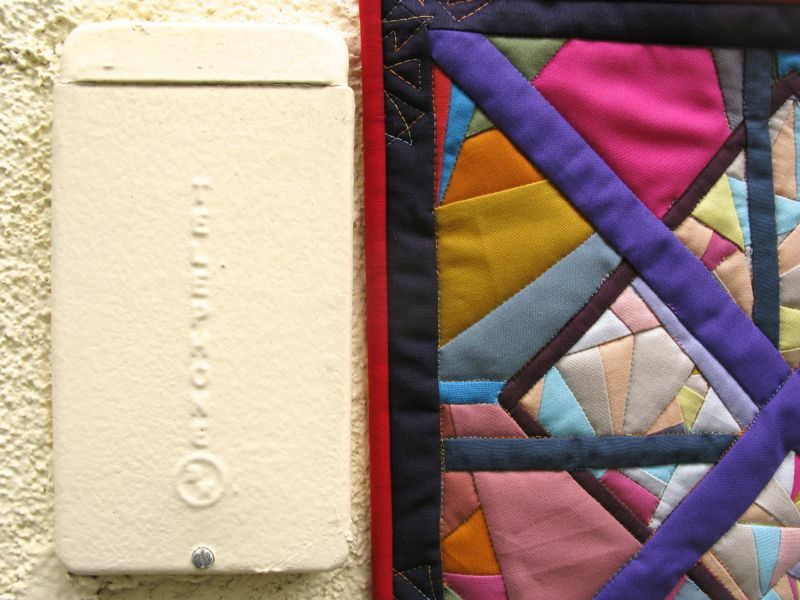 Especially laughed at the quilt next to the utility box. Great idea. Your quilt is wonderful and very well done even if it took a round about way to get there. The distressed envelopes could have been cute but the piece you ended up with is stunning! It was a perfect design place to use improv fabric and solids. I also liked the way you separated the values into the darker outer and lighter inner square, but kept the few bits of darker to liven up the inner. And the various meanings of structure to think about. 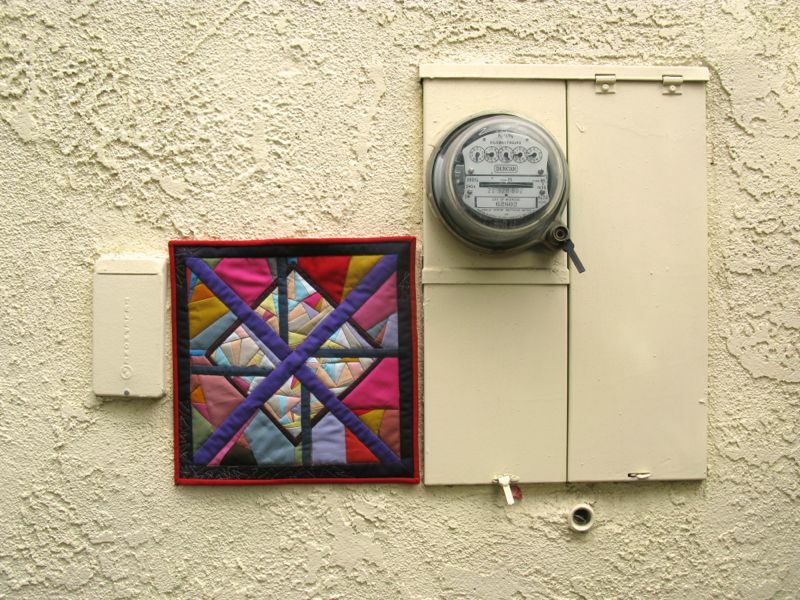 The photo with the electric meter is great. I really couldn’t say it any better than what others have already said…how the structures of our lives have changed, the tiny pieces of your quilt that represent our lives, the connections we make and the clever placement for your photos! You continue to be MY inspiration! Oh, Elizabeth, this is such a great little quilt…there is so much to look at. I was impressed at how much it looks like the structure photo that you snapped looking up from the middle! As always, you have such a wonderful gift of description that made the whole process come alive. Like Suz, I certainly appreciated the photography as well. Fabulous, darling!! I started with Leanne, and at each stop I have been so inspired by how you have interpreted this theme. 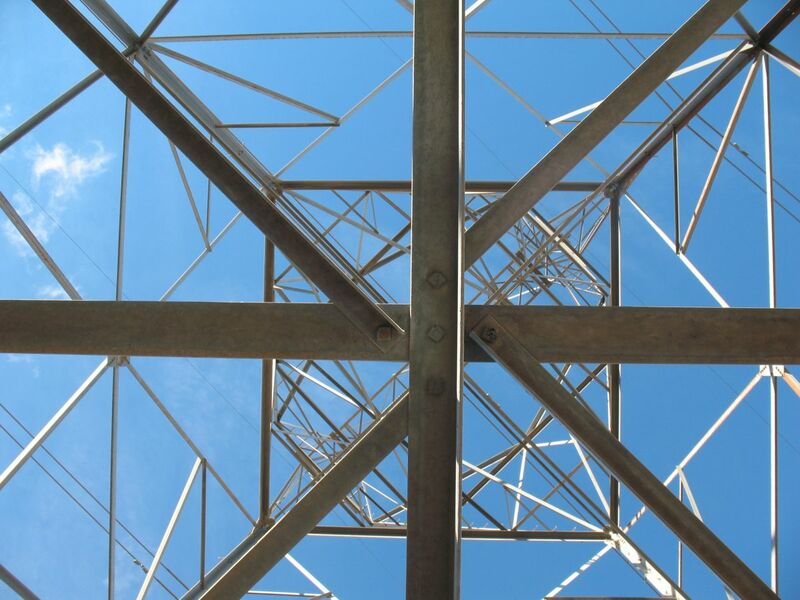 Of course electrical towers are ubiquitous landmarks, and your description of how they link us together and our lives are influenced by them, is awesome. Again, you have created a wonderful quilt. Good that you pushed through the dry spell, as paraphrased from above. I want to ask if you had to lay on the ground to get the photo used in designing this quilt! You were wise to use solid colors so the focus was on the scaffolding and the seams (becoming the wires). 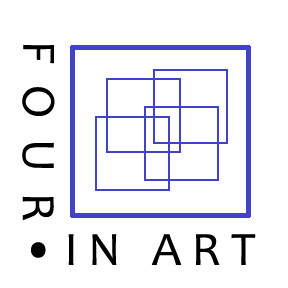 In explaining your concept of the methods we use to link our lives to others, I began to think about how our connections with others (and this Four in Art group) would not existed 40 years ago! Wow! Fantastic! I’m so impressed. You have quite an eye and certainly a bit of determination to get all those seams! Beautiful. This is way cool! Now I’m off to see some of the other fun stuff your group did. Great idea for a challenge! This turned out just wonderful. I wondered where you were going with those little envelopes, and I now see the progression. 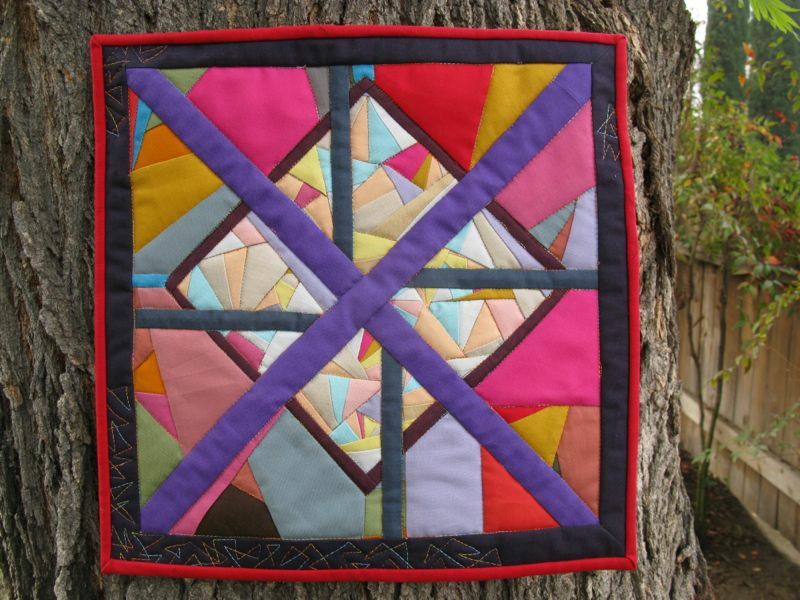 This quilt is so fun and happy with those beautiful solids and represents the inspiration photo very well. Love the photography next to the electrical box, totally made me chuckle. The best pic is the last with the quilt next to the sketch. Tells the story right there. 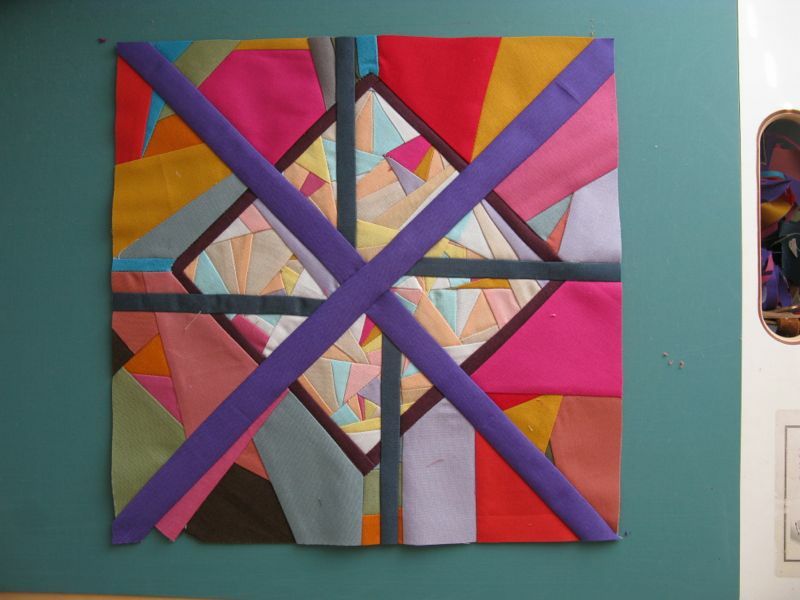 Pingback: WIP: Those Pesky Envelope Blocks | OccasionalPiece--Quilt! You did a brilliant job Elizabeth interpreting the Structure theme! Just catching up (again!) and I absolutely love this one. The use of solids, the fractures… love it.